Been a while since there was a book review, so here's my take on one of Edgar Rice Burroughs' lesser read works. 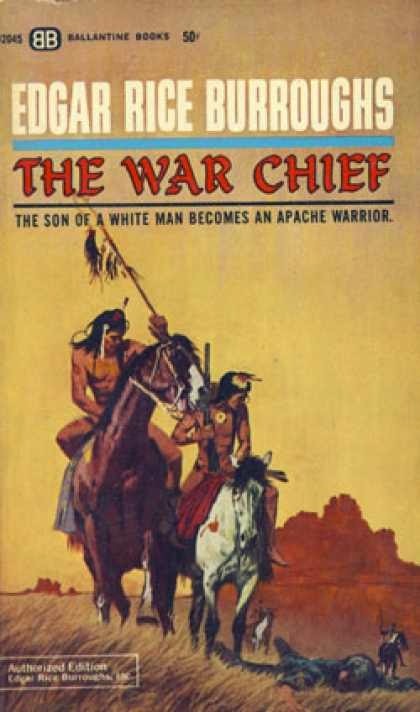 The War Chief tells the tale of Andy MacDuff, a newborn infant who is taken in by Apaches after they kill his parents. Raised by the Go-Yat-Thlay (better known as Geronimo), MacDuff's true heritage is erased as he eventually becomes Shoz-Dijiji, the Black Bear. The rest of his story follows the path of becoming a warrior, the Apaches' conflicts with both Mexicans and Pindah-lickoyee (white man) and the cruel Apache leader Juh. Shoz-Dijiji also learns about love, loss and kindness from two different women, Ish-kay-nay and Wichita Billings and that ultimately each man walks alone. Confession times folks: I'm not a big reader of Westerns. While I love certain Western movies (like Sergio Leone's work and Clint Eastwood films like The Outlaw Josey Wales and Pale Rider) I never took the genre. Probably it has to do with my dad's constantly making my family watch Gunsmoke, no matter how many times he had seen them. So I never really dug into Burroughs' westerns since I was more a fan of Barsoom than the Old West. But know having read The War Chief, it's easy to see why so many Burroughs fans hold it up as one of his best novels, a tight, sharply observant work that draws both on Burroughs' own experiences in the 7th Calvary in Arizona and actual history (like I Am a Barbarian, which I reviewed earlier, it uses real life people to good and touching effect). What's most surprising about The War Chief is the approach Burroughs takes to his subject. At the time most novelists-especially the pulp writers-of the period portrayed Native Americans as immoral savages who killed and pillaged left and right. While Burroughs does include scenes of Apache atrocities, he also shows them as human beings fighting to survive against nature and others. In fact the white characters come off as more heinous in their attitudes and actions than Shoz-Dijiji and his tribe does. This balance was decades before Dances With Wolves and other "revisionist" takes on the genre, showing Burroughs as someone ahead of the curve. If the novel does have its failings its the usual problems Burroughs has. Those who complain his work is episodic will have much to complain about here as the story goes through various conflicts, attacks and events rather than a more straight-forward narrative. I didn't have a problem with that since life is episodic but those who demand narrative drive will be disappointed. Also Burroughs rather clumsily handles the love story of the book, even though one of them is a touching scene, one of the most humane in any of his books. 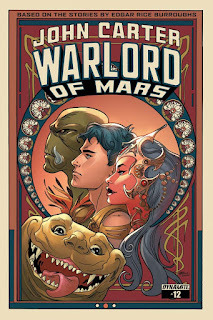 Even with those failings The War Chief is a triumph for fans and non-fans of Westerns and ERB. Give it a chance and you'll see. Rating: **** out of 4.